Iteca Caspian LLC - Meeting place - Caspian Oil&Gas! Meeting place - Caspian Oil&Gas! Caspian Oil&Gas 2016, the 23rd international exhibition and conference, the largest energy sector event in the Caspian region, will take place from 1-4 June 2016 at Baku Expo Center. As a recognised international platform and the key event in the region’s oil and gas industry, the exhibition and conference has been bringing together senior level directors every year to discuss key oil and gas projects in the Caspian region and ensure energy security. The annual participation of Ilham Aliyev, the President of the Republic of Azerbaijan, in the exhibition’s opening ceremony testifies to its high status. The Ministry of Energy of the Republic of Azerbaijan and the State Oil Company of the Republic of Azerbaijan (SOCAR) both show invaluable support for Caspian Oil&Gas. 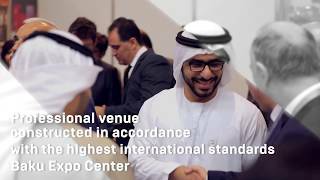 This year, the exhibition will bring together more than 200 companies presenting innovative technologies in oil production and energy transportation, oil and gas storage systems, services, current and future oil and gas projects in the region, and much more. The exhibition will feature companies from Belgium, China, Italy, Kazakhstan, Poland, Portugal, Spain, the Netherlands and other countries. The Czech Republic, Italy and Germany will hold national stands. Each year, Caspian Oil&Gas features new exhibitors, this year from the UK, Portugal, Romania, the USA, and other countries. The event’s status is consolidated by its line-up of sponsors. Traditionally exhibition’s General Sponsor is SOCAR, the Gold Sponsors are BP and Petronas, the Silver Sponsor is Bos Shelf. Among other sponsors are Azeri M-I Drilling, Caspian Marine Services, Global Energy, AZFEN J.V., SOCAR Polymer, Tekfen Construction and other. The exhibition and conference’s General Media Partner is Caspian Energy International Media Group. The conference’s General Sponsor is SOCAR, the Gold Sponsors are BP, General Electrics and Snam, the Silver Sponsor is Inpex, and the Bronze Sponsors are Caspian Geophysical, Dentons, Nobel Oil Upstream, SAP, Schlumberger, Statoil, Total and other.